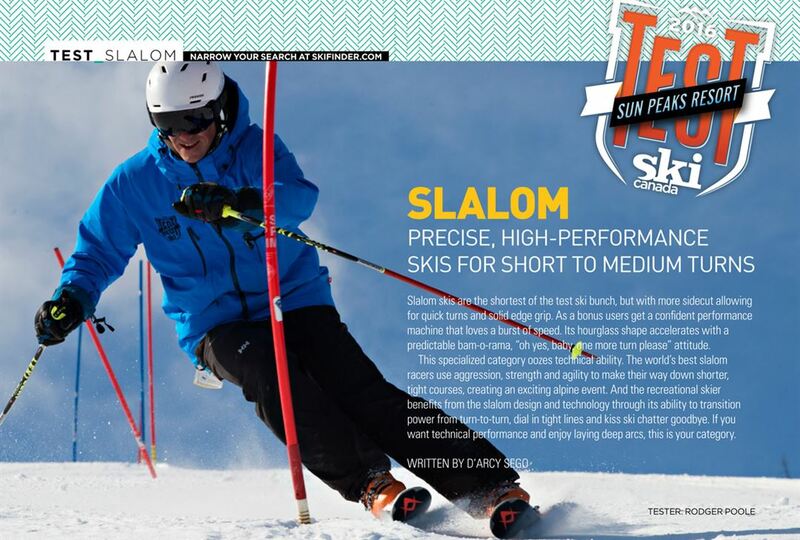 Slalom skis are the shortest of the test ski bunch, but with more sidecut allowing for quick turns and solid edge grip. As a bonus users get a confident performance machine that loves a burst of speed. Its hourglass shape accelerates with a predictable bam-o-rama, “oh yes, baby, one more turn please” attitude. tight courses, creating an exciting alpine event. And the recreational skier benefits from the slalom design and technology through its ability to transition power from turn-to-turn, dial in tight lines and kiss ski chatter goodbye. If you want technical performance and enjoy laying deep arcs, this is your category. MEN: You’ll get a consistent feel through the entire turn and not a single spanking when you’re done. Kristian Armstrong found “this peppy speed machine quick edge-to-edge with lots of rebound, offering an exciting predictable ride.” Go hard, go strong and wiggle this enchilada into ripper mode, enabling you to tidy tight lines in bumps for an onslaught of fun. Getting down and dirty has never been so much fun. Ian March felt “strong experts” would squeeze the most red juice out of this ski. It’s ultra-quick and precise so you can enjoy your ride. Stronger, more accomplished dudes will get the most out of it. WOMEN: Sporty perfectionists will appreciate the sensational edge grip and the tidy-tight torsional stability. 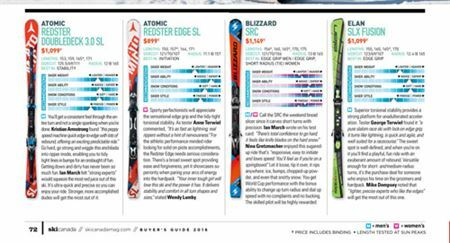 As tester Anne Terwiel commented, “It’s as fast as lightning; real rippers without a hint of nervousness.” For the athletic performance-minded rider looking for solid on-piste accomplishments, the Redster Edge needs serious consideration. There’s a broad sweet spot providing ease and forgiveness, yet it showcases superiority when paring your arcs of energy into the hardpack. 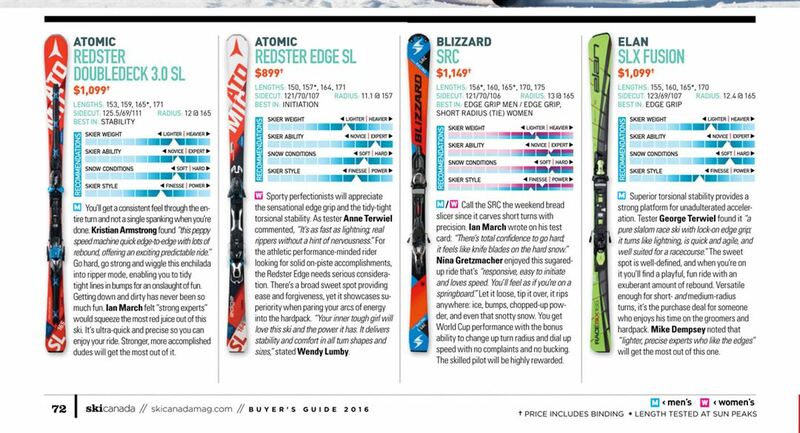 “Your inner tough girl will love this ski and the power it has. It delivers stability and comfort in all turn shapes and sizes,” stated Wendy Lumby. MEN & WOMEN: Call the SRC the weekend bread slicer since it carves short turns with precision. Ian March wrote on his test card: “There’s total confidence to go hard; it feels like knife blades on the hard snow.” Nina Gretzmacher enjoyed this sugared-up ride that’s “responsive, easy to initiate and loves speed. You’ll feel as if you’re on a springboard.” Let it loose, tip it over, it rips anywhere: ice, bumps, chopped-up powder, and even that snotty snow. You get World Cup performance with the bonus ability to change up turn radius and dial up speed with no complaints and no bucking. The skilled pilot will be highly rewarded. MEN: Superior torsional stability provides a strong platform for unadulterated acceleration. Tester George Terwiel found it “a pure slalom race ski with lock-on edge grip; it turns like lightning, is quick and agile, and well suited for a racecourse.” The sweet spot is well-defined, and when you’re on it you’ll find a playful, fun ride with an exuberant amount of rebound. Versatile enough for short- and medium-radius turns, it’s the purchase deal for someone who enjoys his time on the groomers and hardpack. Mike Dempsey noted that “lighter, precise experts who like the edges” will get the most out of this one. MEN & WOMEN: The Dobermann SLR EVO will let you rip the frontside and tame the terrain. This stimulating dog cuts in and out of a turn with ease. It’s forgiving, playful and delivers an exuberant amount of fun. 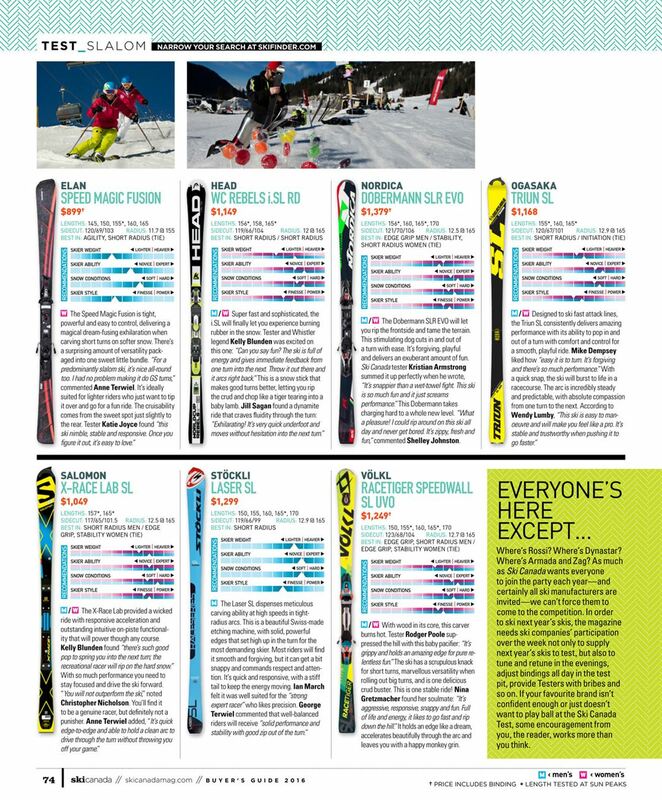 Ski Canada tester Kristian Armstrong summed it up perfectly when he wrote, “It’s snappier than a wet-towel fight. This ski is so much fun and it just screams performance.” This Dobermann takes charging hard to a whole new level. “What a pleasure! I could rip around on this ski all day and never get bored. It’s zippy, fresh and fun,” commented Shelley Johnston. MEN & WOMEN: With wood in its core, this carver burns hot. 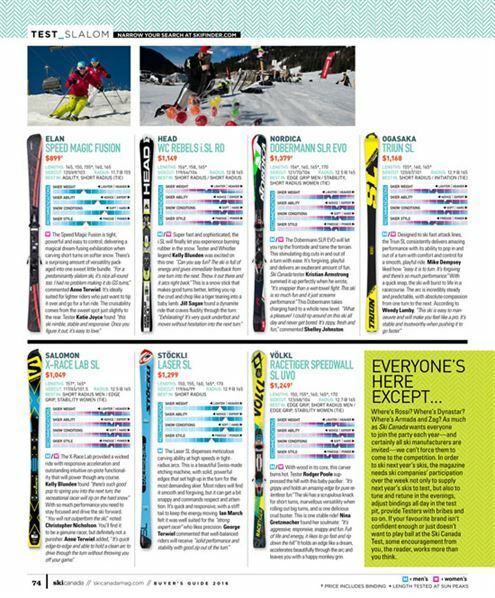 Tester Rodger Poole suppressed the hill with this baby pacifier: “It’s grippy and holds an amazing edge for pure relentless fun.” The ski has a scrupulous knack for short turns, marvellous versatility when rolling out big turns, and is one delicious crud buster. This is one stable ride! Nina Gretzmacher found her soulmate: “It’s aggressive, responsive, snappy and fun. Full of life and energy, it likes to go fast and rip down the hill.” It holds an edge like a dream, accelerates beautifully through the arc and leaves you with a happy monkey grin.